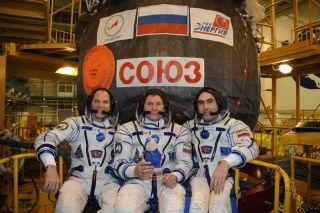 The three members of Expedition 33 pose wearing their spacesuits in front of the Soyuz capsule that will transport them to the International Space Station. L to R: American astronaut Kevin Ford (of NASA), Soyuz Commander Oleg Novitskiy, Flight Engineer Evgeny Tarelkin. Image released Oct. 10, 2012. A Soyuz rocket is counting down to launch a new U.S.-Russian crew to the International Space Station on Tuesday (Oct. 23), a mission that will double the orbiting laboratory's population. The Soyuz rocket will launch a three-man Soyuz TMA-06M spacecraft on a two-day trip to the space station from the Central Asian spaceport of Baikonur Cosmodrome in Kazakhstan. Liftoff is set for 6:51 a.m. EDT (1051 GMT). American astronaut Kevin Ford and Russian cosmonauts Oleg Novitskiy and Evgeny Tarelkin will ride the Soyuz space capsule into orbit during the launch. The trio will arrive at the space station on Thursday (Oct. 25) and join three other astronauts currently aboard the orbiting lab. "For me this is a very new adventure, launching from Russia and launching aboard a Soyuz," Ford, a veteran NASA space shuttle pilot, said in a prelaunch press conference. "The Soyuz is an amazing spacecraft." "It's going to be a wonderful experience to see them in orbit for the first time," Ford said. You can watch the launch live on SPACE.com here via a NASA TV feed. The NASA broadcast will begin at 5:30 a.m. EDT (0930 GMT). The Soyuz rocket is ready to be erected into position after being rolled out to the launch pad by train, on Sunday, October 21, 2012, at the Baikonur Cosmodrome in Kazakhstan. Launch of the Soyuz rocket is scheduled for October 23 and will send Expedition 33/34 Flight Engineer Kevin Ford of NASA, Soyuz Commander Oleg Novitskiy and Flight Engineer Evgeny Tarelkin of ROSCOSMOS on a five-month mission aboard the International Space Station. Ford and his crewmates will join NASA astronaut Sunita Williams, Japanese astronaut Akihiko Hoshide and Russian cosmonaut Yuri Malenchenko when they arrive at the station on Thursday. The Soyuz flight comes at a busy time at the space station. On Sunday (Oct. 28), a private Dragon space capsule will depart the space station to wrap up the first commercial cargo delivery for NASA. The Dragon capsule, built by the Hawthorne, Calif.-based company SpaceX, is flying the first of its 12 cargo missions for NASA under a $1.6 billion deal. Next week, an unmanned Russian Progress cargo ship will launch toward the station. That flight will launch and dock at the station on Wednesday, Oct. 31, making it a Halloween delivery for the crew. One day after the Progress arrival, on Nov. 1, Williams and Hoshide will venture outside the space station on a spacewalk to repair an ammonia coolant leak on a space station radiator. Ford and his Soyuz crewmates also expect to be onboard the space station when another private American cargo ship, the Cygnus spacecraft built by Orbital Sciences in Virginia, makes its debut flight to the space station in early 2013. Orbital Sciences has a $1.9 billion contract with NASA for eight Cygnus cargo missions. Oleg Novitskiy: Novitskiy, 41, is a native of Cherven in the Minsk Region of Belarus and a lieutenant colonel in the Russian Air Force. He and wife Yulia have a teenage daughter, Yana. In addition to his military pilot experience (he has logged 700 hours in various aircraft) Novitskiy is a qualified paratrooper instructor and military diver. He joined Russia's Federal Space Agency as a test cosmonaut in 2007. Kevin Ford: Ford, 52, is the only veteran spaceflyer on the Soyuz crew and first launched into space in 2009 as the pilot of NASA's space shuttle Discovery during the STS-128 mission. He spent nearly two weeks in space on that flight, which delivered 15,000 pounds of cargo to the International Space Station. Ford hails from Montpelier, Ind., and is a retired U.S. Air Force colonel. He and wife Kelly have two children, Anthony and Heidi. Ford was selected to join NASA's astronaut corps in 2000. He has logged more than 4,700 hours in various aircraft and is a qualified test pilot, aircraft instructor and glider instructor. Evgeny Tarelkin: Tarelkin, 37, joined the Russian Federal Space Agency's test cosmonaut ranks in 2003. He is a native of Pervomaisky in the Chita Region of Russia and is a lieutenant colonel in the Russian Air Force. Tarelkin and his wife Alla have two young daughters, Alisa and Anna. He has logged 307 flight hours in various aircraft, is a qualified paratrooper instructor and has performed 800 parachute jumps. Ford will ultimately take charge of the space station as its Expedition 34 commander in mid-November, when Williams, Hoshide and Malenchenko are due to return to Earth. Three new crewmembers will join the Expedition 34 crew in late December. The International Space Station has been staffed by rotating crews of astronauts and cosmonauts since 2000, when the crew of Expedition 1 first took up residency. Construction of the $100 billion space station began in 1998 and has been overseen by five different space agencies representing the United States, Russia, Europe, Japan and Canada. Today, the space station is the size of a football field and has the equivalent living space of a five-bedroom home, NASA has said. It is the largest manmade structure in space. Editor's Note: This story was updated at 7:20 p.m. EDT on Oct. 22 to correct the spelling of Oleg Novitskiy's name.